Unfortunately, in the WWE Network’s 100 Best Matches…List, you’ll ruin some match endings by watching The List in order. By watching this rematch, you’ll see the ending to #1. Knowing the end to a match ruins the suspense a little (the same was the case for the two ‘Mania matches pitting ‘Taker against HHH. The sequel was lower on The List than the original). So I’ll have to spoil the ending of #1 here to explain how the rematch came about. It’s unfortunate, but necessary. No one expected their first ‘Mania match to be special. However, it was a blinder. Of course, back in the Attitude Era, they had great bouts. But no one thought they’d have the same magic more than a decade later. After having a such a great match, the rematch had lofty expectations surrounding it. In my humble opinions, it did not reach those lofty expectations. That’s not to diminish the quality of the match. It’s still a very good bout. But in comparison to its predecessor, it’s disappointing. In places, it’s scrappy. There are a few near botches that threaten to ruin the flow of the match. The botches are a clear sign that both men are nervous about living up to the hype. Of course, you could say that the scrappiness adds to the story of the match. HBK is so desperate to win that he’s not his usual smooth self. But even with that in mind, the near-botches do stand out. (For example, ‘Taker tries a Last Ride but HBK counters it with an X-Factor. However, it’s not an obvious counter. The commentators have to emphasise that it was a counter. Even knowing that it is a counter, it’s hard to see that it is a counter). 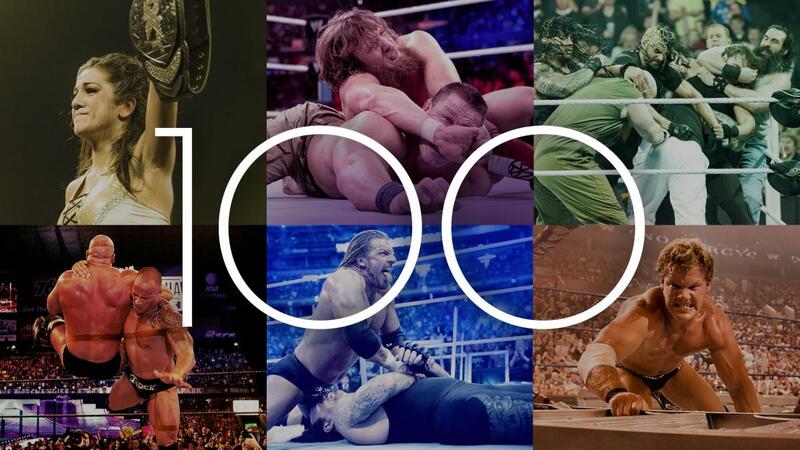 HBK is on the 100 Best Matches…List 11 times! That’s over 10% of the List! They take little advantage of the No Disqualification stipulation, which is another irksome aspect of the bout. I understand the intention was to stop HBK losing his career over a count out or a disqualification, but where are the chairs? The highest high spot in the match is HBK’s top rope moonsault onto ‘Taker through an announce table. Yes, it’s breathtaking, but it didn’t need a No DQ disqualification to happen! It’s also more one-sided than their ‘Mania 25 classic, but that is part of the quality of the match. It’s the story of someone who believes he can do something, but he clearly can’t. ‘Taker has the upper hand for the majority of this match. HBK is a man out of his depth. Yes, he was extremely close to defeating ‘Taker in their previous match. But here, his confidence is his weakness. It makes the match compulsive viewing, regardless of the near-botches. Sometimes, hype can cloud a really good occurrence. My hype blinded me to the positives of this rematch. It’s not as good as their ‘Mania 25 classic, but what is? I think the story in the rematch is more engrossing. I criticise things more if I’m caught up in the hype train beforehand and I’m disappointed. However, there’s no doubt this should be on the WWE Network#s 100 Best Matches…List. It was the best WWE match of 2010. The ending is brilliant. But I’d personally swap this bout with the HBK/Undertaker Hell in a Cell bout (at #37. Click here for my review). It’s a case of two wrestlers trying to create a classic rather than build organically towards it. VERDICT: 8/10. More often than not, sequels are disappointing. The sequel to HBK vs Undertaker from ‘Mania 25 is a little disappointing. But it’s still a very good bout.